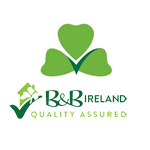 Irish Farmhouse B&Bs include home-cooking and baking as part of the farm-stay experience for their guests. Traditional Irish brown bread is delicious and bed and breakfasts in Ireland tend to serve it with breakfast in the mornings or complementary along with tea/coffee on arrival. Real butter and home-made jam on a slice of Irish brown bread is a tasty treat that everyone should try! This is a great brown bread recipe that you could try yourself at home. Prepare 2 x 2lb loaf tins greased. In a large bowl combine all the dry ingredients. Add treacle and oil to lesser amount of milk and stir into dry mix. The mixture at this stage should be soft and moist. If too dry add some more milk, but do not make it too wet. Spoon mixture into the prepared tins and smooth tops, making a slight hollow along the centre of each. Sprinkle with bran or sesame seeds. Reduce oven temperature to 150C/300F and continue to bake for a further 30 minutes. Remove bread from oven and turn loaves out onto a wire rack to cool.